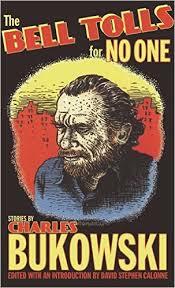 BOLD MONKEY: New Release: Stories by Charles Bukowski The Bell Tolls for No One. City Lights Books, San Francisco, 2015 (308 pages). Edited with an Introduction by David Stephen Calonne. New Release: Stories by Charles Bukowski The Bell Tolls for No One. City Lights Books, San Francisco, 2015 (308 pages). Edited with an Introduction by David Stephen Calonne. This is the fourth book of collected writings published by City Lights and edited by Professor Calonne. It follows Portions From a Wine-Stained Notebook (2008), Absence of the Hero (2010) and More Notes of a Dirty Old Man: The Uncollected Columns (2011). The latest pocket-sized volume consists of 44 stories, most of which first appeared in L.A. Free Press as part of Bukowski’s iconic Notes of a Dirty Old Man newspaper column. The Bell Tolls for No One takes its name from the last short story in the book, first published in Oui magazine. In the story nothing goes right for Henry Chinaski, Bukowski’s alter-ego. He is mistakenly abducted by thugs, hand-cuffed, savagely bashed and his left ear blown off. Left in the woods and still hand-cuffed, a wild dog sets on him. The story ironically ends, “I ran forward, kicked out and missed, fell to my side, rolled over just in time as the flash of fangs ripped the quiet air, I got to my feet and faced the thing again, thinking, this must happen all the time to everybody…one way or the other…” The title is an obvious allusion to Ernest Hemingway’s novel For Whom the Bell Tolls, one of Bukowski’s literary heroes. In the case of the people who inhabit Bukowski’s world, nothing falls into place for them. This collection is better than I imagined but because Bukowski spent most of life writing and rewriting about key moments in his life, you get the impression that you have read many of these stories before. As Calonne points out in his fine Introduction (see the link to it below), “Several of the stories included in this volume demonstrate how he worked and reworked his material. He creates the same narrative anew; he doesn’t copy, but starts over. He is always telling his autobiography but selecting different details, reinventing instead of rewriting.” He uses the example of the excellent short story ‘An Affair of Very Little Importance’ about Mercedes which appears in a different version in his novel Women. The story ‘I Just Write Poetry So I Can Go to Bed With Girls’ appears in a Dirty Old Man column in this volume as well. Also of great interest is the inclusion of The Way the Dead Love (pages 29-58) the beginnings of a novel John Martin urged Bukowski to write in 1966. Several chapters were published in magazines, including this five- part excerpt which first appeared in Congress in 1967. Arguably the best stories in the collection are those in which Bukowski temporarily abandons his over-written life story and focuses more on dredging up the gold of his febrile imagination. The satirical ‘A Day in the Life of an Adult Bookstore Clerk’, the investigations into criminal behaviour in ‘Break-In’ and ‘Fly the Friendly Skies’ immediately come to mind. The best & craziest short story in the collection is the Cold War masterpiece ‘A Dirty Trick on God.’ It begins with Harry Greb, an assembly line packer sitting in a bathtub drinking a beer. He farts and then the bubbles rise to form a “sponge thing with seaweed arms, blue eyes, blond hair.” This is an extremely funny story with a message. You may be able to read it on Google Books.